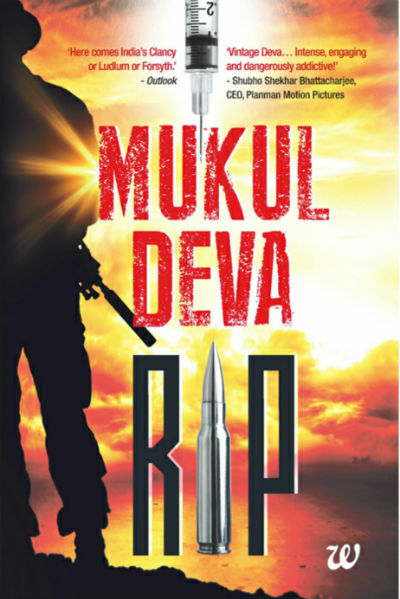 Recently we got a chance to read a thriller named RIP (not – Rest In Peace – but – Resurgent Indian Patriots : 1) by author Mukul Deva. It was really a nice experience and here are our detailed views and reviews for the same. The book falls into the thriller category and despite being a crime thriller, just considering it a crime thriller is an injustice to the book. It is a combination of detective fiction, spy thriller and almost all the ingredients of a typical masala film. You can see it as a complete package for thriller lovers. Let us explore it to see whether it is something worth going for. Let us take a bird’s eye view to the Plot of the book. While I will try my level best to avoid spoilers but you may expect some, so please read with that consent. A retired para-commando and his team come to the conclusion that the political system in India needs a serious cleanup. It doesn’t matter which party comes to the power, the wrongdoings with the public and the motherland are not stopped. It is the country and countrymen who suffer at the end. Corruption is so deep-rooted into the system that it exists in almost all the segments. An activist named Hazarika (does the name strike any resemblance to Anna Hazare? Well, there are more such stuff you can relate into in the book) appears as the ray of light. He is protesting to get a bill passed in the parliament which makes the politicians accountable, and he is getting global support for his act. Colonel Krishna and his K-Team think that this is the best time to strike. As the public is awakening and fed up with the system, once people will see some serious actions they will come ahead with new clean and patriot leaders, who actually want to serve the country. He declares an ultimatum under the name of a fictional group RIP (Resurgent Indian Patriots) that if the government is not taking the issue of corruption seriously and start punishing those who did wrong, the team will start executing one such corrupt figure in next 24 hours! And that is not it, this will continue for 3 days, so 3 corrupt figures from any segment will meet with his/her death in next 3 days. On the quest the K-Team have tough opponents to face; it includes rich and cunning politicians, arms dealers, government machinery including police, armed forces, SPG and NSG Commandoes, private security forces and a team lead by Raghav, another para-commando with weak character but immense combat and strategic skills. There is a lady reporter, who comes into the picture and becomes an important part of the story. There are two boys, a few politicians, intelligence system officials and many more characters who appear and makes their mark. As all the K-Team members are retired from the force and settled with their family, only their anonymity and skills are on their side. If this cover is blown, they cannot survive. So will they be able to complete their mission and accomplish the first step in making India corruption free (or at least free of corrupt fellows)? It is explored in a pretty thrilling manner in the book and you got to read it to get the answer. Let us start with the cover page, as it makes the first impression. Whatever we say, but those who are randomly buying books often judge book from the cover. If in the bookstore, people then try to go through some of the pages of the book, in case the cover is attractive, and make a decision. So, for a large number of book buyers, the cover page is one of the influencing factors for sure. The cover page of the book is attractive and interesting at the same time. A syringe represents the killings done silently by infusing a lethal drug into the victim and bullet represents the killings done in open. The theme of the cover page represents the thriller mood quite effectively. So we would like to give distinction for the cover page design. Overall, the story of the good goes with the feelings of most of the common citizens, and that’s why a large number of readers will like it for sure. In that terms, you can compare the book with a complete masala entertainer movie with the falvor of patriotism. Mukul Deva himself has served in Indian Armed Forces for around 15 years, and he possesses authority in various stuff. As an author, he doesn’t shy away in naming various scams bluntly, for example, Bofors. Also, the characters are taken from the real life, but to avoid controversies, here he changed names for all them. But a reader will definitely be able to link the dots. He intelligently integrates the famous Anna Hazare movement in the book. The author is good in showing how the commandoes plan their mission and execute it. And he is able to add thrills to it as well. His knowledge of weapons and real tactics comes as an aide and reader enjoy each step of the mission without a doubt. The characters are built gradually and distinctively. Mukul is very clear about the attributes of the characters and he infuses them quite effectively. And, it is not all about war against crime and corruption. The story has emotional quotient as well. Be it the brother-sister relationship between Col. Krishna and his sister or his friendly relations with the news reporter, or even the friendship between two kids, the relations are explored realistically. Even the characters of politicians and government officials are author backed, and so does the character of Raghav. There is some adultery associated with Raghav’s character. Though, I understand that author can justify it as the demand of the story if it could have been avoided the book would have become a perfect thriller without anything to complain. But, at the same time, some reader may enjoy it. I, personally, like to avoid such stuff. Mukul Deva is good at explaining surroundings and building scenes. You often feel that you are actually visiting the places when reading about it. It is his success as an author. Stressed men were dangerous men. No matter how good, no warrior lasts forever. And death needed only just that one tiny window of opportunity. It’s obvious that deals were struck… you stay off our backs and we will stay off yours when we are in power. It doesn’t matter which party is in power, sir, our country always loses. Time seemed to be moving faster than usual… as though his watch was on speed. Isn’t that always the case when on a mission? Despite their personal and political differences, and the fact that they belonged to different political parties, all three she that camaraderie and brotherhood that Ali Baba’s forty thieves must have shared. Sheru Yadav too had a family to feed; and a large one at that, with one wife, two mistresses and several children from all three of them. Not to mention the ever-increasing tribe of relatives and hangers-on, that grew in direct proportion to his rising power. … he realised that old habits die hard. There are some loose ends too. For example, when the technology is so advanced, how none of the things are covered using CCTV. By watching the CCTV footage of the party anyone could have identified the attackers easily! And once it is known that who are under threat, if their security is beefed up so much, why no one, even the intelligence bureau officials think of installing (if not already) CCTV cameras to the target places. It is completely out of context. Also, a glossary could have made the book even better. The conclusion could have been more specific, but the author has left many things half-said. We can, however, give him benefit of doubt, that the second instalment of the book is going to explore those things in detail. The name of the book suggests that there will definitely be another book in the series (if the author doesn’t think about it to skip it). The author has interestingly written a very different kind of disclaimer than what you read in some other books/media. He confirms that he deliberately skips writing some stuff and even mention some features/attributes wrongly, so no one can use that classified details about weapons, and the way such commandoes work, for any wrong intentions! There is no detailed explanation which can help some wrong people in doing such work. It is, in a way, a good attribute of the author. Overall a good book which is a complete masala entertainer with the flavor of patriotism. You will enjoy reading it, and more importantly drawing links to some real-life people and incidents. 7-8 stars out of 10.